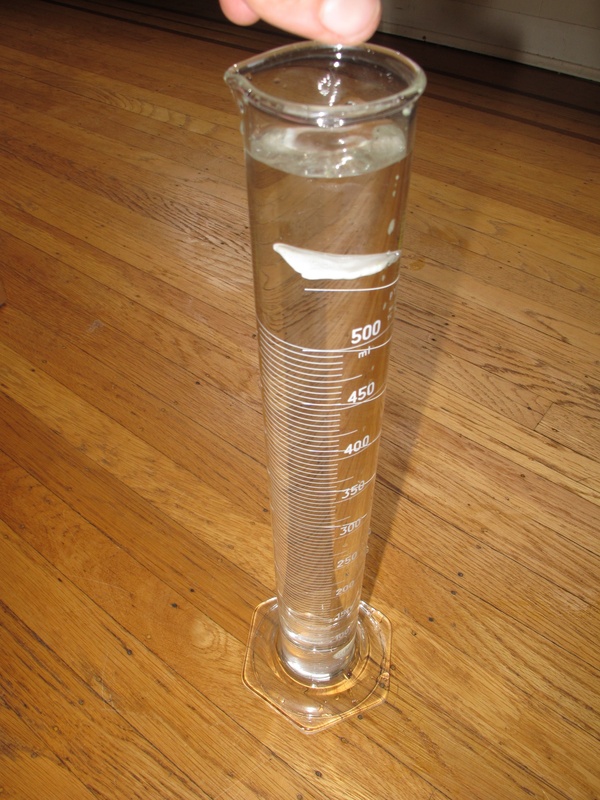 Experiment with water and differently shaped objects to feel the force of water resistance. Use one of two set-ups to feel the force of water resistance. 1. Fill a tray with water. Mould similar-sized pieces of plasticene into different shapes e.g. flat disc, round ball. Optional: attach a chopstick to each one as a handle. Drag the shapes across the tray of water to feel the water pushing against them. Compare how much the water pushes on the different shapes. This activity can also be simply done by pulling a stiff piece of plastic through the tray of water. By orienting the plastic in different ways as it is pushed through the water, varying amounts of water resistance will be felt. 2. Fill a cylinder with water. Drop the shapes into the cylinder and see how long they take to fall to the bottom. A more complex set up of a similar activity at Water resistance: racing shapes through water. As an object moves through water, the water that contacts the leading edge pushes back - called water resistance, or drag. The more water that hits the front of the object, the greater the drag. So with a constant force moving the object forward, increased drag will slow it down more. Boats are built with a streamlined the shape that keeps drag to a minimum. Swimmers shape their bodies to be as streamlined as possible to reduce the drag as they move through the water. However both swimmers and canoe paddles take advantage of the water pushing back to help move themselves forward when they make an arm or paddle stroke.